Note: Cactus "Plural" is accepted as: cactus, cacti, or cactuses. It is an international debate about which is the most appropriate. If for any reason you would like to comment, please do. Send us an email. "Cactus" is our current choice at NewPort Arizona. Most people don't think of loving a cactus like they do an orange tree or their roses. Some people are like cactus, they are beautiful and unique but you would not want to hug 'em. Well, if the cactus were not in the make up of the desert, it would not be the stage of legends and settlers of yesterday and today. It is a whole differnt world we live in because the cactus are here in Arizona. They are great landscaping accessories and accents for any yard. The contrast of a harsh desert with its rough coated plant life and terrain against the delicate blossoms and sweet unforgetable fragrances, is just something to see. Something for which to fill up your senses. When you do it'll be another motivational reason in your life experience for moving. This beautiful Saguaro Cactus Flower is so pleasant to see. It has an incredible desert aroma. It is white petalled with yellow center leaves and stamens filled with pollen. It has a slight waxiness to the touch of its petals more like a citrus leaf yet much more delicate. Saguaro Cactus Flowers are supreme because they live on the largest cactus in Arizona. 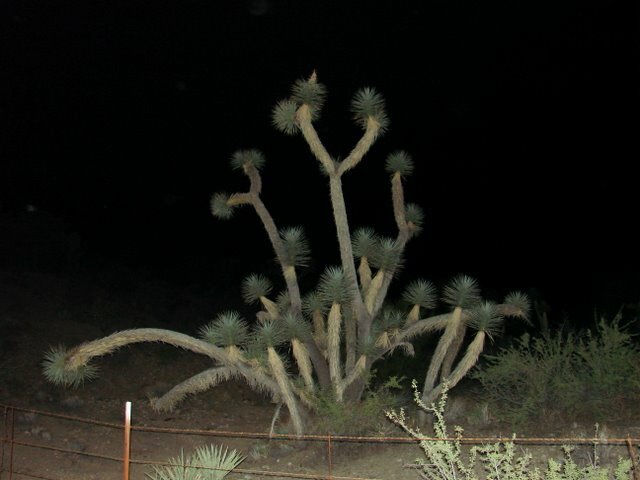 Bats, insects and birds help to cross pollenate the Saguaro Cactus Flower at night. Typically they blossom at night from April to Mid June. The Saguaro Cactus Flower bloom opens during the night and closes by midday the next day. Eventually it closes down completely. If the Saguaro Cactus Flower has been cross pollinated, the blossom will turn into a red fruit type appendage on the Saguaro Cactus. Birds, bats and insects love these fruit like delicacies. Our Cactus Wren can be found nesting in the Saguaro Cactus Flower beds, as if the natural wreaths of Spring were the wren's idea. Some of the Saguaro Cactus Flower blooms cover the entire cactus. Some cactus will only have one bloom and, of course, there are those that have none. The array of the Saguaro Cactus Flower blossoms are truly a natural work of art. Bring your camera. Nature has provided the Gila Woodpecker. 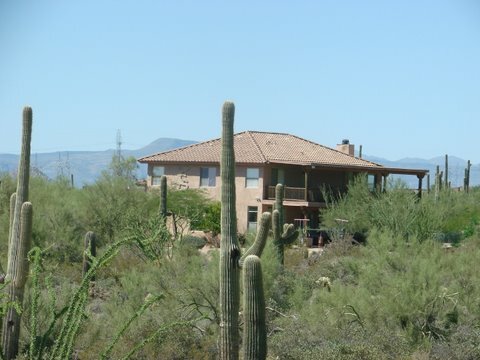 It will peck holes and make residence inside the trunk of the Saguaro Cactus. When the woodpecker is done with the nest; bees, cactus wren and some other critters will call it home. Owls like the hollow too. It has been said by many that if you get stuck in the desert in Arizona without water, that you can retrieve water from the Saguaro Cactus. You can not. Visitors try to eat it like a watermelon. It may make you sick. Don't do it. If you happen to be stuck in early to mid June, you may see the red fruit that once was the Saguaro Cactus Flower. This is edible but does not have the best of taste for humans, nor is there any significant amounts of water. More on Cactus The most obnoxious cactus is the Cholla Cactus. Many want to call it the jumping cactus. It does not jump as you walk by. It does not have sensors and does not try to attack you like many desert hikers rumor otherwise. It does have very loose connections to its main plant. So if you barely touch it the piece will fall to the ground or attach to your shoe and/or clothing and you may not even be aware of it for hours. If a strong wind blows a clump of spine needles will attatch to almost anything near by. When the cactus branch falls it will spread itself in all directions. If you happen to be present when it falls you might think it is jumping at you. These clusters really hurt if they make it onto your flesh. Some unawares who venture barefoot or just socks from the car to relieve natures call may come back with toes and feet and even booty throbbing. It is not easy to pull them out. These truculent cactus are found all over the State of Arizona. Be careful, bring the tweazers... actually the needle nose pliers are more useful with this cactus. The most wonderful cactus is the Prickly Pear Cactus. It has wide beaver tail shaped branches. This cactus is a pale green to dark green in color. It has a beautiful reddish purple colored and pear shaped fruit. The fruit when fully ripe is delicious and very sweet. You must be cautious when harvesting the fruit. There are very small "prickly" needles on the fruit (not the cactus, the cactus itself has mostly long needles). 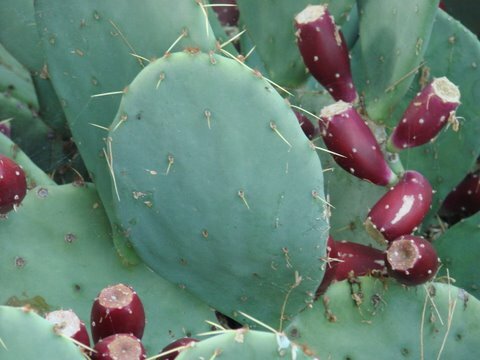 If you are not wearing gloves and you touch the prickly pear, these very small and fine needles will then attack your skin. You can not pull them out of your skin. You must wait until the body can attack the intruder. These little needles travel just under the surface of your skin. They eventually stop moving and the body disolves them and they are evacuated by natural means. They hurt for days. They can invite infection. Some hot soaking will help but the needles won't co-operate if you want them out. One gentleman told us that the needles went in one hand and came out at his shoulder and armpit area. So pay close attention. It is deceptive because it looks like there is space to touch the fruit and not get poked. Don't believe it. One should use a knife to peel and harvest the prickly pear. Wear a good leather glove. Peel the skin with the knife. Once the skin of the prickly pear is peeled away the fruit is very pleasant like a softer tasting, non-tart stawberry or blackberry. We like to think that the prickly pear is our answer to Hawaii's tropical kiwi. Ours..., It is harder to eat! Now back to the Saguaro Cactus just for a moment. Many people from around the world want to see a Saguaro Cactus and the Saguaro Cactus Flower because they have been told that they are bound to the interior borders of Arizona growing in the wild. It only appears that way. We can say it is partially true. When you leave the Arizona borders the vegetation changes in the next State you visit. New Mexico has not one Saguaro that is natural and wild. Enter its border and find one... We dare ya! Remember that the Saguaro Cactus Flower is seen usually between late April and Mid June. If you are here at that time take advantage of the beauty. (They like to show off!) 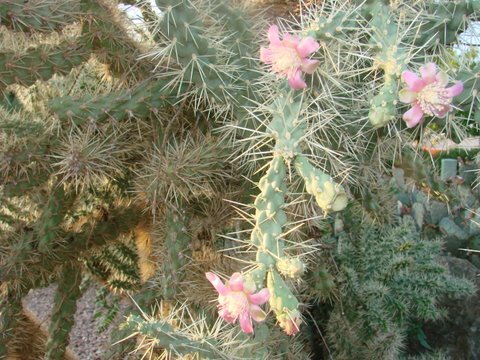 There are thousands of other cactus blooming too as well as desert poppies and other varieties of flower. Check it out for yourself. If you see the Saguaro Cactus in another State take a picture and we will post it here. There are many in Mexico, none in California, Utah, Nevada or Colorado. Then again we could be wrong. Prove it! Arizona is the main attraction for Saguaro Cactus. They are the symbol of the Cowboy West everywhere in the world. They are depicted in movies, books and commercials to be from Texas, Nevada and Oklahoma. But you won't find them there. 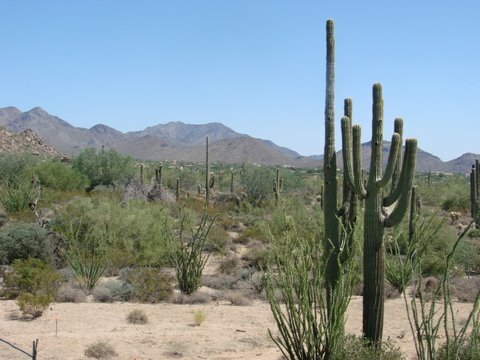 In Arizona cactus will grow pretty near anywhere in the State up to about 9,000 feet. The higher the elevation the less plentiful but they are up there. The most widespread cactus is the Prickly Pear. They grow all over from the Sonoran Desert to the San Francisco Peaks outside of Flagstaff. Two more cactus that are really cool to see. Then we'll let you go. Maybe... The Organ Pipe Cactus and the Joshua Tree. We won't tell you where they are exactly, but they are so odd looking and fun you can't believe what your seeing. Well, here is a hint, the road from Wickenburg to Kingman you'll see a Joshua Tree forest. The Joshua Tree may not even really be a cactus but what would you call it? It's named Joshua because the arms form a Y shape and reminded pioneers of the story of Joshua from the Holy Bible raising his arms in prayer to God. The name stuck. No pun really, it just came out that way. You can order Prickly Pear Products from our General Store anytime.